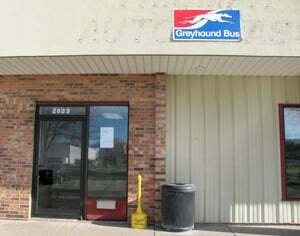 The newest, only and most remote Greyhound bus stop in Madison is at 2023 S. Stoughton Road, off Highway 51. Bus company officials still hope to return to downtown Madison, but until then, only a taxi-cab, a friend with a car or an insider's knowledge of city bus routes will get you to the new station. 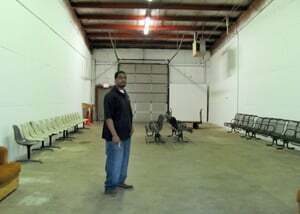 Brian Mastin is a Greyhound station agent at the Greyhound bus stop in Madison, located at 2023 S. Stoughton Road. The interior is Spartan and the station can be difficult for riders to locate and get to. Now that the Badger Bus Depot at South Bedford Street and West Washington Avenue has been levelled, the trek to catch a Greyhound bus may be the most trying part of the journey. At Greyhound's newest and only Madison stop, 2023 S. Stoughton Road, station agent Brian Mastin said last week the bus company and its 20,000 annual passengers will return to Downtown "eventually." The new station, where the bus company formerly managed its package pickup service, is a small storefront in a strip mall with a tiny sign out front. Inside, there is a spacious and clean, if Spartan, waiting area, recently outfitted with a couple of comfy used sofas. Getting there, however, can require an investment in time or money or imposition on a friend for a ride. A trip from UW Hospital, for example, via Metro Transit to the Greyhound station would cost only $2 but would take an hour, include at least one transfer and leave a passenger a half-mile walk. Estimates of the cost of a taxi ride from the hospital to the station range from $16.50 to $30. Mastin said there are clear "mixed feelings" from passengers about the station placement. "It's close to the freeway, and people like that," he said. It's far from Downtown, and people don't like that. "And for people who use public transportation and travel on the weekends, it is difficult to get here," he said. Last Wednesday, passengers waiting for a noon Greyhound to the Twin Cities were puzzled at the station's placement. "Man, they need at least a bigger sign, something, more lights," said Aswa Washington, a University of Minnesota-Duluth student, whose friend had dropped him off at the station. They drove right by without noticing the small sign, and had to call for directions after missing the turn off Highway 51. Amanda Dinauer, a UW-Madison student from Minneapolis, thought she was catching the Greyhound from the usual spot, the Badger Bus terminal, and found out only at the last moment that the terminal was razed and the pickup spot had moved to the Southeast Side. "I had to call a relative at the last minute for a ride, otherwise I never would have found it," she said. Once the cold weather starts, it could be even more difficult. There is no accommodation for pedestrians to walk alongside Stoughton Road from the two nearest Metro Transit stops. There is no sign at either of the Metro Transit stops that would point an inexperienced traveler toward the Greyhound stop around the corner. Add fickle weather, the need to carry baggage, or shepherd a family, and the difficulty is exacerbated. "Unfortunately, the (Greyhound) site is now located on a frontage road that doesn't have adequate pedestrian access for us to safely pick up and drop off passengers," said Metro Transit's Mick Rusch. "There would need to be some improvements at the Greyhound site such as sidewalks and a crosswalk to make the stop locations both accessible and safe for pedestrians. "We're waiting to determine if this would be a permanent location for Greyhound. If it does become permanent, then we would begin to look at ways to work with Greyhound to bring Metro stops in closer to their station," he said. Anecdotally, Metro Transit service representatives estimate they get fewer than a dozen calls daily for information about how to get to the Greyhound station, Rusch said. In Madison, 11 Greyhound buses stop daily, said Tim Stokes, a Greyhound spokesman. Most Madison passengers are students and senior citizens, he said, about seven passengers for each bus. Annual total is about 20,000 passengers. Despite that number, intercity bus travel to Madison has not been a topic of study by the Greater Madison Convention & Visitors Bureau, said its president, Deb Archer. "It's certainly likely that visitors use buses to access destinations," she said. "But the majority of our clients are more inclined to be driving or flying, versus bus travel." Mastin, the station agent, said his stop "gets a lot of long-haul passengers," while the other intercity bus companies that come through Madison - and stop Downtown or at the Park-and-Ride on Dutch Mill Road - are Milwaukee-, Chicago- or Minneapolis-bound carriers. He hopes Greyhound returns to Downtown Madison. "Oh, we'll be back Downtown eventually," he said. "There are a lot of students who just like to pop out of bed and roll over to the Greyhound station, that's us." Having trouble getting to the new Greyhound station at 2023 S. Stoughton Road? Greyhound Lines officials said Thursday that starting at 6:35 a.m. Friday the company’s buses will pick up and drop off passengers at Metro Transit’s North Transfer point.